Home » Handyman Blog » DIY Furniture » Is your table too short? Maybe this is the solution! So, we have a nice large table in the kitchen, but the table is too short. As a family, if we are eating at home, we are eating at this table. The problem is that it’s too short. My wife has had this little table riser project on my to-do list ever since we acquired the table from my parents. They were ready to downsize their table, so it was now or never! The table itself is 28 3/4″ tall. That in and of itself isn’t the problem. The problem is the stringer / frame that holds the top to the legs. It is another 4″, which when coupled with an ever more eclectic collection of dining chairs we were feeling the pinch with leg room. Our solution was simple. What I’ve made are simple blocks that increase the height of the table by 2″. I looked around the out buildings at home and found a scrap piece of gray 4″x4″ wood. I cut four 4″ pieces off with a chop saw. When I did so, I noticed that the wood had beautiful color and grain on the inside, so I refined my idea to include showing as much of the beautiful grain as possible. What I came up with is tapering the block so it’s wider at the bottom with a 5º taper on all four sides to the top. The last thing I did was to use a paddle bit large enough to make a hole for the table leg bottoms to fit into the block. 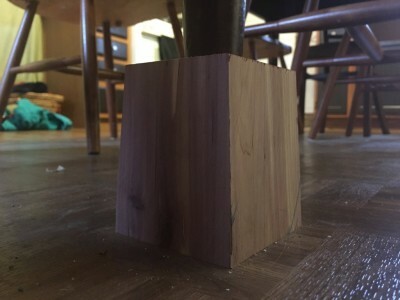 As opposed to making 2″ blocks, the full-height blocks with a hole half way through enable the table to be moved around without removing the blocks. It turns out that the scrap wood I found in the barn is cedar, and is really nice. The extra 2″ of leg room get the job done, and the table is much more comfortable to sit at now.